Lookers PLC kicked off 2019 in style as they took over the City of Belfast to host their ‘We are Lookers’ conference. 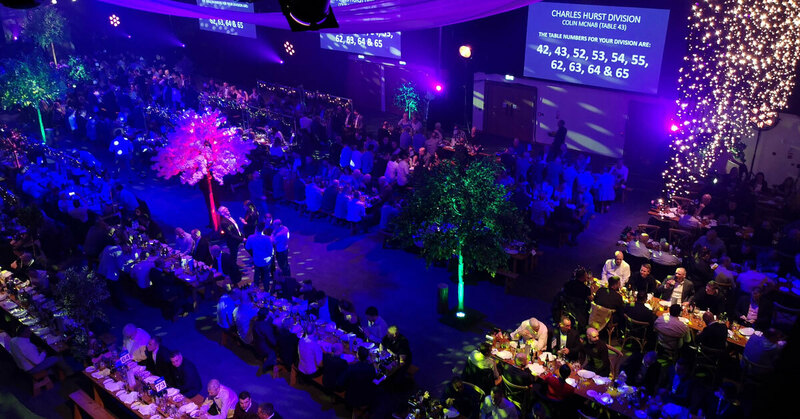 Celebrating diverse talent among its people, the flagship event saw over 700 senior employees from across their automotive divisions (Taggarts and Charles Hurst) descend into Belfast. Positioning their plenary session in our state-of-the-art Main Auditorium, Belfast was the perfect backdrop to celebrate one of their key divisions, Charles Hurst. The event saw an influx of delegates touch down in Belfast International Airport and George Best Belfast City Airport where they were greeted with a warm welcome. 'We are Lookers’ branding was displayed across the arrival lounges and throughout both airports from luggage collection to taxi pick-up. That's not where the branding ended! Lookers PLC painted the town blue with key messaging throughout the three day stay. ‘We are Lookers’ and ‘Lookers is for Everyone’ was displayed throughout the city. With more than 10 creative messages across the digital adshel network, Lookers were able to direct delegates to their destination; from ICC Belfast, to their chosen hotels, Cathedral Quarter and beyond! With messages such as 'This way to ICC Belfast ' and 'Lookers Party This Way', the delegates were navigating like locals in no time at all! All 700 delegates were able to walk to each of their destinations with ease. This was all made possible thanks to our media partner Clear Channel. Belfast truly is a city like no other, its accessible routes gave Lookers PLC the opportunity to take over, not only ICC Belfast, but the city in its entirety! Belfast has been a fantastic location and a very gracious host. The fully integrated service provided to us, was nothing but outstanding! It was a conference like no other, with Sarah Stirk, Sky Sports Presenter and award-winning author Damian Hughes taking to the Main Auditorium stage to provide insight and guidance on people management. Lookers Chief Executive Andy Bruce and Chief Operating Officer Nigel McMinn emphasised their desires to become a truly diverse and inclusive employer and retailer, as well as highlighting their successful efforts in attracting more female employees into the business. Following this exceptional line up of keynote speakers, delegates made their way to Hall 1 where lay a gala dinner like no other! It was ‘unique…very different to anything we’ve done before’ according to Heike O’Leary. It was a Bavarian beer style tent that had local gin distiller, JAWBOX Jerry as well as local YARDSMAN craft beer. The room was exceptionally dressed by SBD Events who created an ambience of togetherness, which complemented the theme of the conference exceptionally well. We wish all those shortlisted for the Lookers Excellence Awards on the evening the very best of luck! We hope to see you back in Belfast soon. This year’s conference was a huge success and will no doubt help to inspire our people to go on and achieve even greater success once they get back to their respective dealerships. Our industry is facing some major challenges at present, however, what our conference has highlighted is that Lookers continues to buck the trend in a number of areas and its our diverse mix of people and skills that have helped us to achieve this. Looking to do something similar?